Thirteen is one of those birthdays that is quickly becoming one that requires a bigger celebration than it did when I turned to my teenage years. What are young ladies 'in to' in the 21st century? The cell phone here suffered a little, but it came out ok in the end. As you can see, it was amended before being attached to the cake. Initially, the grand topper of this cake was to have been the pair of fondant stilettos I made recently, but, alas, they were simply way too big! The centre of the two bottom layers of the smaller, top tier, were hollowed out and stuffed with chocolate M&Ms, the top layer, obviously, stayed in one piece to hide the hollow and ensure the cake looked as it should. The top tier is a very 'grown up' plain ivory whilst the bottom tier is a wonderful marbled effect using ivory, white and fuschia pink. It was a thought I had to be symbolic of being a fun-loving new teenager, but with an element of an emerging 'adult' head. Due to the fact that I couldn't use the shoes as a topper, I was left with a large expanse of, well, nothingness on some of the cake, so I made pearl beads from fondant, and draped them over the cake. I think I works rather well. I also added a few fuschia pink and while marbled roses on the top where there was a little tear in my fondant and to fill in some blank areas. 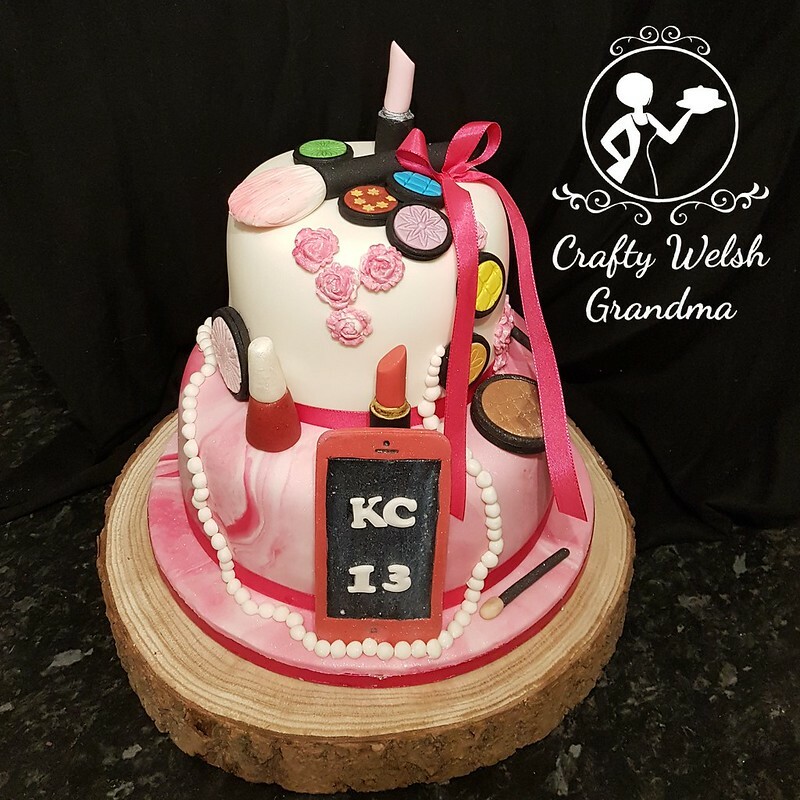 Topped off with a fischia pink ribbon and bow plus a sprinkling of magic, edible glitter, this cake is totally perfect for the teenager it is destined for. Ever wondered what happens when my back is turned? My creations are destroyed and utterly enjoyed!